HOUSTON (AP) — It began 10 years ago while on a quest for French chandeliers. Instead, Dorothy McFerrin bought what she believed to be an Easter egg created by the famed Russian artisan Peter Carl Faberge. "I thought, 'Oh my God, I have no light fixtures, but I have this Easter egg,'" Dorothy McFerrin said, laughing when she recalled purchasing that first egg. Quickly, though, she learned she had been duped. She had spent thousands of dollars on an egg covered in real gems and gold that was not the work of the Russian czar's personal jeweler. That mistake sparked what has become nothing short of an obsession. Today, McFerrin and her husband, Artie McFerrin, own one of the largest private collections of authentic Faberge items in the United States. 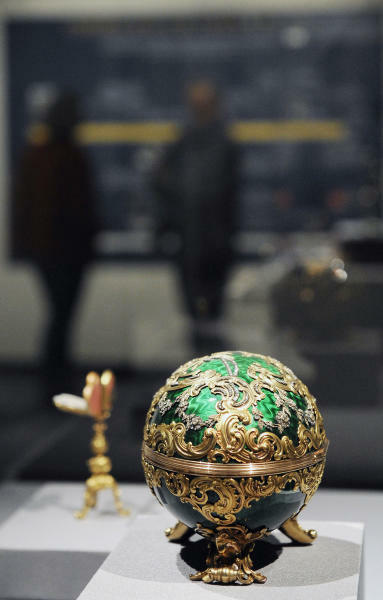 Included in that collection, now nearly all of which is on display at the Houston Museum of Natural Science, is one egg gifted by the Russian czar to his wife, and two others considered by experts to be among the "big ones" because they were made for the Nobel family of later prize fame and the Kelch family, affluent merchants from Moscow. "It is interesting. It's a good investment — the prices have just risen over the years, especially as the Russians have gotten interested," McFerrin said, explaining the interest she and her husband have in collecting Faberge pieces. "A lot of it has gone back to Russia and will never be seen again." 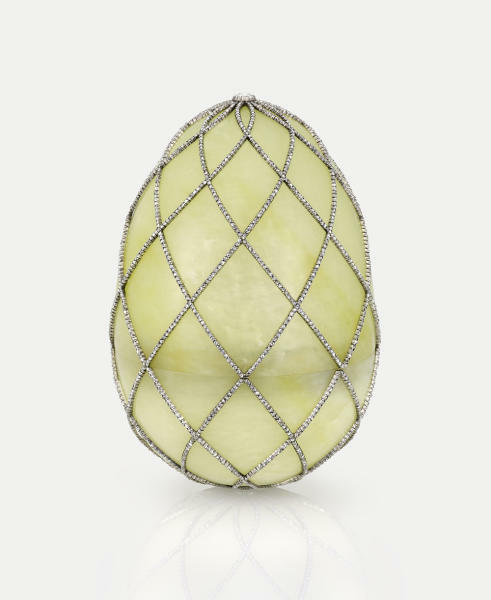 The tradition and creation of Faberge's ornate Easter eggs began in 1885, when the Czar Alexander III gifted one to his wife, apparently to commemorate the 20th anniversary of their engagement. He was so delighted by the egg and its cleverness — inside was a little bejeweled "surprise" — that he ordered one every year, a tradition continued by his son Nicholas II until 1916. Each egg took more than a year to create, and often the czar was intimately involved, whispering ideas to the artists as they worked in secrecy on the piece. Of the 52 eggs Faberge made for the Romanov family, 42 have survived, according to the website of Faberge, a modern fashion house that makes creations under the name of the 19th century artist. Dozens of other eggs were made for other affluent families — though only the czar's wife could have the color mauve in a creation — and the McFerrins own between 40 and 50 of those. "There was certainly a culture of luxury at the court and a general indifference to the vast differences to the way the royal family lived and the vast majority of the people in the country lived," said Joan Neuberger, an expert on modern Russian cultural history at the University of Texas in Austin. "Nicholas II was particularly averse to engaging with the social and economic realities of the country that he governed and at the time enjoyed ... giving lavish gifts to his wife." By 1916, Russia was in the throes of World War I and the anger that would lead to the first Russian Revolution, which would erupt just months later, was already brewing. In 1918, after the second revolution that brought the Bolsheviks to power, Czar Nicholas II, his wife, their five children, their servants and their dog would be executed at the orders of Bolshevik leader Vladimir Lenin. Faberge, and his Easter eggs, was viewed as a symbol of the disparities between the country's small affluent class and the more than 85 percent who were landless servants. The Bolsheviks, as part of their revolution, seized Faberge's shop and the family fled to Paris, leaving all his creations and tools behind. Over the years, the collection — now worth tens of millions of dollars — has spread out across the globe. Some has never been found. 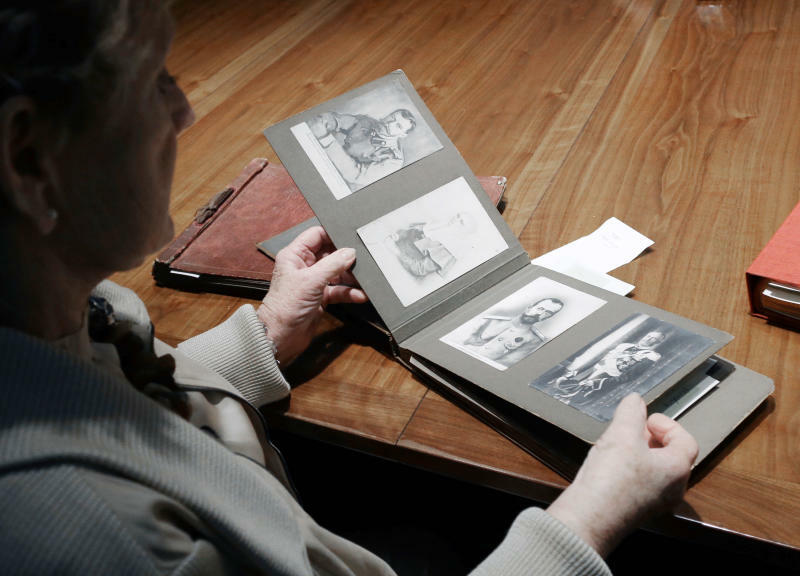 While the McFerrins have a broad collection of Faberge and czarist artifacts, including photo albums of yellowing pictures of the Romanov family, ornate cigarette holders, exquisite jeweled matchboxes, elaborate gold-threaded women's evening bags and even the pillowcase in which some items were smuggled out of Russia, the focus of most collectors are the so-called Imperial eggs the Czars had made as Easter gifts. The quest to find and purchase the eggs evolved almost into an extension of the Cold War as a race erupted between wealthy American and Russian collectors to get their hands on the most eggs. Today, roughly half are believed to be owned by Russians, though not all are in the country, McFerrin said. About 11 are displayed in the Kremlin. To understand why the Czar was gifting his wife such a lavish gift on Easter — rather than, say, on Christmas — one has to understand the significance of the holiday in Russia. Easter comes on the heels of winter, a frigid, snowy season, said Joel Bartsch, the Houston museum's president and something of a Faberge expert. It is a time of rejuvenation and renewal, a time to look over the past year and correct mistakes. "Americans just look at it as Easter and the Easter bunny. But for Russians, it's their high season, at time for rejuvenating your life," McFerrin said. And eggs are inextricably tied to the holiday, key even in a special cake generations of Russians have baked on the holiday to have blessed at church, she added. The McFerrins, who made their fortune in the Houston-area chemical and petroleum industry, are committed through the purchase of the artwork to sharing not only Faberge's art with a new generation that may know very little about the czars and their tragic downfall, but also the ideas Russians associate with the Easter. "We love it because of the workmanship. It's a lost craft, it will never be reproduced again," McFerrin said.